We’d love your help. 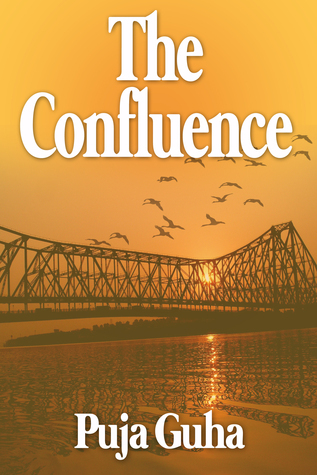 Let us know what’s wrong with this preview of The Confluence by Puja Guha. To ask other readers questions about The Confluence, please sign up. In The Confluence, Guha brings together the diverging members of a fictitious extended family in a global world. At the beginning of the story the main character, Naina, is writing a letter to her grown adopted son to explain the details of his unknown birth family. She’d been living in Paris, and went to meet her Mother-in-law to be in New York after getting engaged. Since her In-laws were in politics, they did a background check to know how to spin her past before the tabloids got hold of anything. Inadvertently, the investigation pulled up the detail that her Mother’s sister had abandoned her husband and son. So, realizing how traumatic this separation from family was to her Mother, Naina travels first to East Africa to locate the missing Aunt and hear her story. Then, she travels to Kolkata India to locate the child her Aunt had abandoned, now grown with a son of his own. In reconnecting, Naina finds herself in a revolution, with bombs (both emotional and real) dropping and events spiral beyond what she ever dreamed would happen. In the end, it is her cousin’s young 3 year old that she adopts and raises. The confluence of family lost, though born of pain and loss, results in a beautiful peace and happiness for her and her loved ones. Puja Guha has an ability to force communication between the characters in the story by separating the reader from the events that take place. It is this distance from events that are so integral to the story that creates the sense of lost time, and pain that you feel as you read. With each event, you realize the character should have been there, but instead they must learn of the event from a distance. It really is a good way of getting the point across, and I didn’t miss the car chases and gun fights typical of action stories. After all, it’s a relationship drama, not an action movie. I requested and received a free copy of the Audible version for review purposes. The narration was done by Yael Eylat-Tanaka with a most enjoyable authentic accent. Once I’d started reading I couldn’t put it down. The recording quality was not great. But, the quality of the reader and the impact of the story made me ignore the audio quality. If not for that, I’d probably have given it a 5 star rating. I do recommend the story for readers who enjoy relationship stories. Puja Guha is an author sure to have upcoming literary success. And, that title was really appropriate, I thought. A very moving concept!
" Ms. Guha writes from the heart and does not fail to move the reader with her narration of the events leading to her and her husband's decision to adopt a member of her family. The book is heavy with emotions-not in a depressing way-but in a manner that strengthens your faith in the extended family." I received a free copy of this book from the author through Book Review Buzz. The preparation of her wedding leads Naina to dig deeper into her past. With the hope of finding the truth and a lost relative, she flies to East Africa. What she finds is more than she has ever expected. Just a few pages and it will be hard to put this book down. One question raises, a clue is given, a secret is unveiled. But beneath it, many layers of secrets raise many more questions. One more clue is found, one more I received a free copy of this book from the author through Book Review Buzz. Just a few pages and it will be hard to put this book down. One question raises, a clue is given, a secret is unveiled. But beneath it, many layers of secrets raise many more questions. One more clue is found, one more secret is revealed. But again, there are still more and more layers to uncover. In the end, some secrets stay hidden. But that's life, not all questions have answers. With strong-minded protagonist, being set in the middle of revolution chaos, and tearful scenes, this story is very stirring. This is a novel of love, loss, friendship, and the ties that bind a family together. The review is based on the audio book. The story is based in the future when a mother decides the time has come to inform her adopted son who is about to become a father himself on how he became to be adopted and the family relationships. Naina Ranjeeva does this through a letter telling the story of the past in present time. She includes the social unrest and political situations of that time. It takes a bit getting used to in the beginning to the back and forth of the present and future but one The review is based on the audio book. Naina Ranjeeva does this through a letter telling the story of the past in present time. She includes the social unrest and political situations of that time. It takes a bit getting used to in the beginning to the back and forth of the present and future but ones you get used to that the book is amazing. The narrator did a wonderful job and the way it was read you could just visualize the feelings and emotions going through Naina as she tries to put this letter together for her son. This is a wonderfully-written family drama that drew me in right at the start and made me want to continue reading page after page. The story takes place primarily in Bengal, India, and in a fictional east African country that combines the attributes, cultures, and ways of thinking of several real east African countries. The characters are likable, well drawn, and very real. I felt as if I were intimately involved in their personal struggles. A real plus is the author's writing style, which is ea This is a wonderfully-written family drama that drew me in right at the start and made me want to continue reading page after page. The story takes place primarily in Bengal, India, and in a fictional east African country that combines the attributes, cultures, and ways of thinking of several real east African countries. The characters are likable, well drawn, and very real. I felt as if I were intimately involved in their personal struggles. A real plus is the author's writing style, which is easy-to-read, logical, and contains no typos, misspellings, or grammatical errors. Especially after having read a whole string of books where I've been taunted by these problems, Ms. Guha's writing is totally refreshing. Yes, you should read this book! This is a great book. The story is heartfelt and compelling, without being sappy or melodramatic. The author does a great job of interweaving the backdrop of political and societal upheaval into the story without having it overwhelm the story itself. There are times where the dialog seems a bit stilted, but I'm guessing that is a cultural thing that reflects more on me that the story. This book is one of those rare gems that keeps me coming back to Reading Deals. I was provided with a complimentar This is a great book. The story is heartfelt and compelling, without being sappy or melodramatic. The author does a great job of interweaving the backdrop of political and societal upheaval into the story without having it overwhelm the story itself. There are times where the dialog seems a bit stilted, but I'm guessing that is a cultural thing that reflects more on me that the story. I received the audio book for free for an honest review. I honestly enjoyed the book. The narrator had a very pleasant, easy to listen to voice that helped me to experience every emotion that was conveyed in this storey. The main character Naina details the circumstances surrounding her sons unusual adoption in a letter written to him. I haven't read a book like this before which is a big plus for me. I recommend this read. This was well written and beautifully emotional to read. The story is told by Naina Ranjeeva who is writing to tell her adult adoptive son the story behind his adoption. It is an interesting and very emotional story told with love and great detail. The descriptions of the places in the story are brought to life and the characters are all flawed but each has a story and a reason for decisions they made that others found hard to accept. It is a story of a family split by one sister's decision and ho This was well written and beautifully emotional to read. The story is told by Naina Ranjeeva who is writing to tell her adult adoptive son the story behind his adoption. It is an interesting and very emotional story told with love and great detail. It is a story of a family split by one sister's decision and how Naina Ranjeeva finally brings them back to some understanding and a bit of a truce but along the way things don't work out so easily and there is a lot of hurt and heartbreak. The synopsis is misleading: The Confluence is not set in the future of hovering self-driving vehicles and super sized TV screens in public places. This novel is about a mother in 2045 writing to her son, her adopted son, about how things came to be in 2017. Set in a fictitious East African nation, capital Taisoun, India and USA, Naina Ranjeeva, recently engaged is visiting her future in-laws in New York City. The opening scene made me chuckle: Naina’s hoity-toity Mom-in-law is going to have Naina’s family checked out by their PI. In typical WASP style, she brings a touch of interesting aspect so prevalent in today’s society: class segregation by way of the mighty dollar. During the ‘interview’ with her Mom-in-law, a lost aunt comes up, who abandoned her husband and son years ago. Naina is torn between wanting to make things right with her family, namely reuniting her mother with her sister and her own life. She embarks on a around the world crusade to find her lost aunt and her cousin, Nitu. While in East Africa, where a revolution is brewing, Naina finds out that Nitu is living in Calcutta. She hires a PI and finds Nitu, who has a son, Nikhil. She succeeds in bringing Nitu and his mother in East Africa together-more jetting around-the smoldering revolution erupts, Nitu is hurt while walking at night and is hospitalized. During this time, he reveals that he has cancer and is dying. Naina, with her marriage just around the corner, chooses to take care of her cousin in Calcutta, dying of cancer. This decision is all the more incomprehensible, as she hasn’t seen this cousin in over twenty years! It is noble indeed. The family jets around the world from New York to Calcutta to East Africa in a dizzying pace. Naina is nice, too nice and at times self-deprecating. No one is flawed, but if they are, she understands. This book is in dire need of more action i.e. more showing instead of telling would underline the strengths of this narration. The revolution in East Africa, where Naina’s aunt lives, with whom she’s had no contact for over two decades, is told from a distance. There are powerful elements vying for a spot here, but they don’t come to light buried as they are in the telling. Despite these flaws, this is a touching story of enduring family ties. Puja Guha has a unique voice that begs to break out of its ‘nice’ confines. The story is about Naina and her journey through family secrets, difficult time and adoption of her son Nikhil. This is beautifully narrated partly in letter format, written to Nihkil by Naina where she tells him about her journey in life. When Naina is about to get married to Dev she discovers the location of her long lost aunt who now lives in East Africa. The curiosity to know what happened to her and her cousin Nitu, she goes to visit her aunt and finds out that her cousin now lives in Calcutta, India. Things go wrong when there is turmoil East Africa (a fictitious country), and with revelation of some deep family secrets. It took me forever to pick this book partly because the cover didn’t really impress me at all. But the book blurb was intriguing and boy-oh-boy was I in for a surprise. The letter style of story telling was nice and you can really picture the story as it’s been narrated. The characters feel relatable and the story flows relatively with ease. There is a certain amount of richness with the characters coming from different places and you get a taste of different countries. It did bother me some to understand why the book was called “The Confluence” and took some thinking to relate it to the actual meaning of the word to the story. It’s the coming together of people or things like in Naina’s life. If you are like me and judge books by their cover, I’d recommend you to let that go and try this book. You’ll not be disappointed. This book starts out with a mother writing a letter to her adopted son in 2045 telling the story of how he came to be a part of the family. It doesn't take long, though, before the book evolves into the mystery of solving a family secret in 2017. The only problem is that the person trying to solve the mystery ends up being caught in the crossfire of a country in revolt. Right before she is married, Naina is reminded of her long lost I was given this book for free in exchange for an honest review. Right before she is married, Naina is reminded of her long lost cousin Nitu. She is compelled to search for him, and is taken on a journey from Paris to Africa to India, and beyond. In the midst of a family drama, the book takes you right into the middle of a tough situation. The Republic of East Africa may be fictional, but it seems like it has some very real problems. In this story, Naina is about to get married when she discovers that her long-lost aunt is living in East Africa. Wary, but interested in finding out what happened to her favorite cousin, Naina takes a trip that will change her life. She meets with her aunt and through trial and error finds her cousin living in India, but things quickly go wrong. What with the turmoil in East Africa (a fictional country that the author says is a composite of other countries in the area she has explored) and some deeply buried family secrets, Naina and her soon-to-be husband Dev have some big decisions to make. The Confluence is a heartfelt letter from the mother to her adopted child. The letter is used as a prop to tell the tale of a child's family history. When Naina, the mother, is proposed to by Dev, his family being of a certain class not wanting scandal, they begin private investigations into Naina's past. This in turn inspires Naina, partially in fear of what might be uncovered, to go and search for her cousin she lost contact with twenty years previous. We are whisked away to the turmoil in Eas The Confluence is a heartfelt letter from the mother to her adopted child. The letter is used as a prop to tell the tale of a child's family history. When Naina, the mother, is proposed to by Dev, his family being of a certain class not wanting scandal, they begin private investigations into Naina's past. This in turn inspires Naina, partially in fear of what might be uncovered, to go and search for her cousin she lost contact with twenty years previous. We are whisked away to the turmoil in East Africa, then to the slums of Calcutta as Naina attempts to understand the intricacies of her families past. What begins as a mystery turns into a heartfelt tale as Nitu, the cousin, is found, as too his child and the mother that abandoned him. I enjoyed this book. It is light but engaging. And wears its pathos well. Words are what make the difference between good books and great ones, and Puja has the right ones that always makes her works stand out. I still haven't finished savouring the taste of The Ahriman Legacy when I tripped and fell on this. and here I feel there is more that I can relate to. It presents the bitter truth in an embellished well-narrated manner. It all revolves around Naina and her son Nikhil. It follows Naina as she unveils to her son some ancient family secrets few are privy to. Every Words are what make the difference between good books and great ones, and Puja has the right ones that always makes her works stand out. I still haven't finished savouring the taste of The Ahriman Legacy when I tripped and fell on this. and here I feel there is more that I can relate to. Every scene was properly painted vividly with colourful words that deceive you into thinking you're actually watching it unfold. "Contemporary Indian Family Drama/Women's Fiction Confluence" is how The Confluence is presented upon opening the first pages of the book. adoption in 2017. None of which we are led to believe he knows anything about. We along her adoptive son Nikhil experience the family secrets and events that decided the life he was about to have. Now in 2045 and about to be a father Naina has decided she must share her story wi "Contemporary Indian Family Drama/Women's Fiction Confluence" is how The Confluence is presented upon opening the first pages of the book. It did however leave me with a longing to know how Nikhil received the news in this letter. Perhaps a sequel will someday follow. A wonderful read! I enjoyed it immensely! I would love to read a part two written. Fell right in love with the little boy! This is a Goodreads win review. This book is about an East Indian mother and the letter she writes to her son about how she adopted him. Very moving story. I enjoyed the format - letter to her son. It was very heartfelt and easy to get involved with. Wish it gave the son's reaction to the letter though, maybe a sequel!